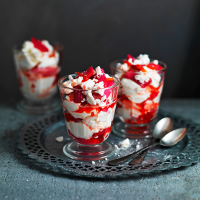 Inspired by Yorkshire rather than Eton, this winter mess pairs rhubarb with one of its natural bedfellows – ginger. 2. Cut the rhubarb on a slight diagonal into 3cm lengths (or longer if you have thin stalks). Spread in a single layer in a roasting tin and sprinkle with the sugar and ginger syrup. Scatter the stem ginger over the top, cover with foil and place in the oven for 20-30 minutes, checking regularly, until the rhubarb is squashably soft, but still holding its shape; set aside to cool completely. 2 Carefully pour all the liquid from the rhubarb tray into a small pan and bring to a boil. Bubble for about 2-3 minutes, until it turns syrupy. Leave both the rhubarb and syrup to cool separately. 3 Just before serving, put the cream and vanilla in a large bowl; whisk until it leaves a ribbon trail on the surface that just holds its shape. It should be soft and wavy, or the mess will be too thick. 4 Spoon ¾ of the rhubarb and ½ the syrup on top of the cream. Roughly break most of the meringues over the top and fold everything together. Divide the mixture between 4-6 bowls or glasses, topping with the remaining meringue and rhubarb. Splash with the reserved syrup before serving.